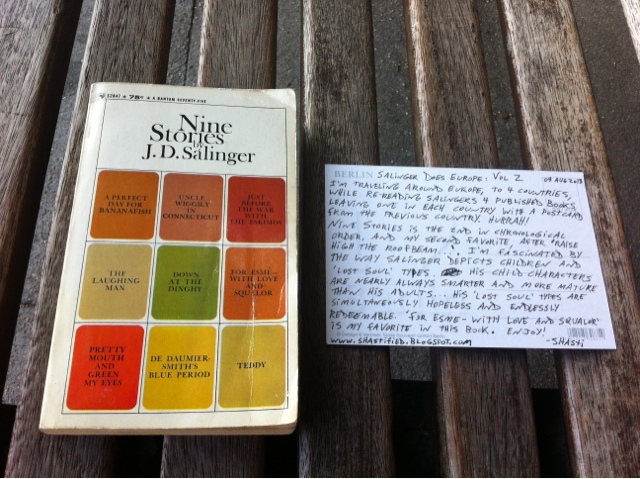 As mentioned in a previous post, on this trip I’m re-reading the complete published works of J. D. Salinger, and leaving them behind, one in each of the four countries I visit, with a postcard from the previous country. Nine Stories is my second favorite of Salinger’s books, and the second he published after Catcher in the Rye. It’s where he introduces, in snapshots and references, the Glass family that becomes his main subject… although I’ve always felt that Holden from Catcher in the Rye is close, sort of an early stab, perhaps a distant cousin or a former classmate to one of the Glass children. My favorite story is For Esme, with Love and Squalor. I simultaneously love and am disturbed by the way Salinger depicts children throughout his work. They are always smarter and stronger and more honest and more complete and more ‘real’ than the adults… Part of what makes Holden in Catcher in the Rye such a despicable and unsympathetic character is the fact that we encounter him in the process of losing his childhood and becoming just the sort of person he so despises. He convinces us so completely of the awfulness of that sort of person, that we hate him nearly as much as he hates himself and so his self-loathing becomes complete through our own complicity. We’re unable to catch him and save him, just as he’s unable to catch the lost ones and fix his crumbling world. We’re sure at the end that he’ll be mostly alright, but it’s the ‘alright’ of someone who has lost something and forgotten what it was, so it’s deeply tragic. Anyway, enough rambling about the last book. Nine Stories is great, and it continues the same sort of investigation of childhood/adulthood/innocence/jadedness/loss of self/self-loathing/etc and is fundamentally, like most of Salinger’s work, simultaneously tragic and incredibly hopeful. For Esme, with Love and Squalor is sort of a miniature summation of everything I love about his writing. Highly recommend.